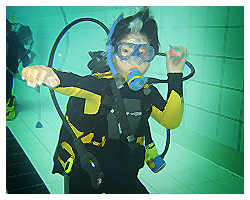 PARTY - Bluewater Scuba - "Where Nashville Learns To Dive"
Just Add Water to your Next Party! 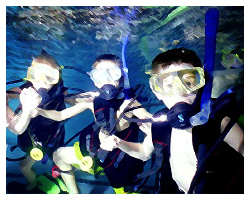 Host your next birthday party or special occasion at Bluewater Scuba in our indoor, heated, 50 foot pool. The weather outside doesn't matter. The weather's always great and the water's always 84 degrees. Reserve your party day TODAY! $225 for up to 15 participants. Note: Pool is 3 1/2 feet deep in the shallow end. Smaller children may not be able to stand. There is an 18 inch deep step the length of the pool for sitting and holding on. Download Party Reservation and Contract form here. 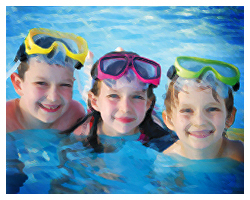 Note: A list of party participants and an emergency contact Phone Number for each participant must be provided to Bluewater Scuba prior to any pool activities. See page 4 of the Party Reservation and Contract Form. $325 for up to 12 participants. Download Bubblemaker Medical Statement form here. Download Youth Diving: Responsibilities and Risks Acknowledgement form here. $300 for up to 8 participants. 90 minutes of scuba instruction in the shallow and deep end. $30 credit towards the purchase of a full Open Water Training Package within 30 days. Download Discover Scuba Medical Statement form here. Send us your Party Request! Please fill this out this and provide 3 options (day/time) for your requested party, then click "Submit." The balance of the party fee will be due upon confirming the date and time with Bluewater Scuba.